Kourtney Kardashian was spotted out and about in Los Angeles wearing Rick Owens Virgin Wool Textured Deep V-Neck ($495.00), RtA Dexter Belted Distressed Jeans ($325.00), Saint Laurent D-Frame Acetate Sunglasses ($355.00) and Celine Pointed Heeled Mules (Sold Out). Sofia Richie was spotted leaving the gym in Los Angeles wearing an Alexander Wang AWG Long-Sleeve T-Shirt (Sold Out), Kith Cody Cooling Mesh-Paneled Stretch-Jersey Leggings ($115.00), her Celine Cat Eye Sunglasses ($460.00) and Adidas Originals POD S3.1 Sneakers ($70.50). Hailey Baldwin was spotted out and about in New York wearing an Oversized Shawl Collar Blazer ($1,900.00) and Oversized Turtleneck Sweater ($650.00) both by Philoshophy di Lorenzo Serafini, High-Rise Straight-Leg Jeans ($490.00) and Silver-Tone Buckle Croc Belt ($450.00) both by Alberta Ferretti, Celine Square Sunglasses ($500.00), two Anita Ko Safety Pin Earrings ($2,000.00 each) and Adidas Originals SC Premiere Sneakers ($109.00). You can find a similar blazer for less at NA-KD ($35.95) and Revolve ($52.00). 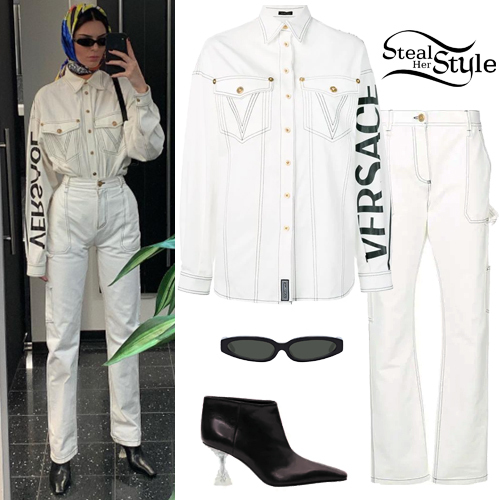 Kendall Jenner posted a picture on instagram wearing a Logo Denim Shirt ($1,267.00) and Straight-Leg Jeans ($775.00) both by Versace, Linda Farrow 960 c1 Angular Sunglasses ($580.00) and Celine Facetted Heel Low Boots (Sold Out). Lady Gaga arrived at the 61st Annual Grammy Awards at the Staples Center in Los Angeles wearing Céline Spring 2019 RTW Dress (Not available online), Tiffany & Co. Blue Book Collection Necklace (Not available online) and Jimmy Choo Max Platform Sandals ($995.00 – wrong color). 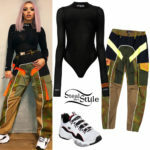 Jesy Nelson posted a picture on instagram wearing a Gucci Technical Jersey Dress with Zip ($3,980.00), a Missguided Knitted Top ($23.00 – co ord set), Mid Blue Ripped Mom Jeans (Sold Out) and Hockey Clear Pointed Boots (Sold Out) both from Topshop, and Celine Aviator Sunglasses ($560.00). Sofia Richie was spotted leaving Tra di Noi in Malibu wearing the Adidas Originals Adibreak Track Jacket (Sold Out), Alo High-Waisted Airbrush Leggings ($95.00), Céline Cat-Eye Sunglasses ($326.00), a Chanel Classic Quilted Flap Bag ($4,940.00 – preowned) and APL Techloom Pro Running Shoes ($139.95).